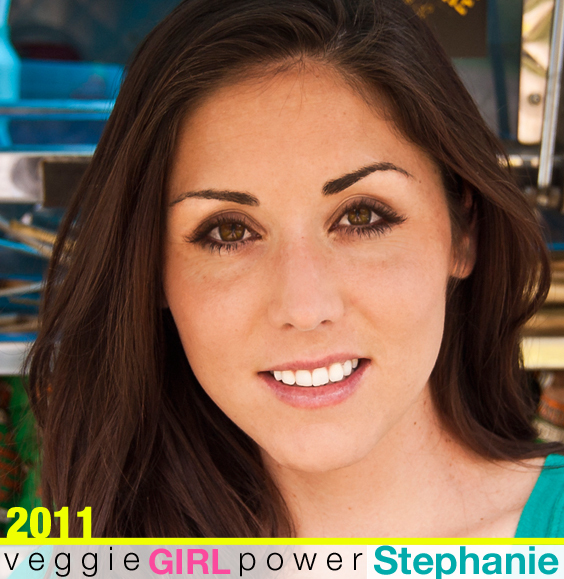 Next up in my 2011 Veggie Girl Power Interview Series is the owner and founder of SeaBirds vegan food truck, Stephanie Morgan. Not only is the SeaBirds truck famous for being a beloved, vegan-eats staple of Orange Country, California - but SeaBirds also gained nation-wide fame last summer when Stephanie and her team competed on season two of Food Network's reality show: The Great Food Truck Race, with host Tyler Florence. Meet the "Mama Bird" behind the truck!.. Life on a food truck. As a food blogger, food trucks fascinate me. I love them. With their creative, ever-changing, locally-inspired menus, mobile addresses and social-networking savvy. Passion and enthusiasm for food served up in each dish. Recipe to plate. And over the past few years when I lived in NYC, I saw how the popularity, mainstream appeal and trendiness of food trucks really boomed. Food trucks went from lunch-hour back-up-plans to "stand-in-line-for-hours-just-to-get-a-bite" hot spots. But the question for me was, "Where are all the vegan food trucks??" Stephanie Morgan answered that question for the lucky residents and visitors of Orange County California when she founded SeaBirds. (And yes, there are a few other awesome vegan food trucks nationwide like Cinnamon Snail in the NYC area). Last summer, the SeaBirds gave us a real vegan reason to watch Food Network when they were contestants on The Great Food Truck Race. Stephanie and her team, including the talented Nicole & Raya, definitely held their own as they battled head to head with mainstream, meat and cheese-loving food trucks. It was inspiring to watch the ladies find veggie inspiration in every new town they arrived in. It was proof positive that where ever you may find yourself, vegan deliciousness is just a recipe away. Let's meet "Mama Bird" of the SeaBirds!.. Stephanie: Smoothie! With rice milk, orange juice, raw protein powder, ground chia seeds, frozen mango, banana and wild blueberries. Stephanie: I’m inspired by any one dedicating their lives to improving the health and lives of others. I’m a huge fan of Ellen Degeneres, Julia Childs, Pink, Tanya Petrovna and Isa Chandra. Stephanie: Although I pretty much went vegan overnight, the world around me was not on the same page. I quickly realized how every menu I read was dominated by meat and cheese. The inconvenience of being vegan was what turned me on to cooking and I am grateful for that because it ignited a whole new passion in me. Stephanie: It happened for me when I started wondering about all the ingredients I couldn’t pronounce in so many of the foods I was eating. I walked down to the Borders on E 86th St and bought about 6 books on food, nutrition and the politics of our food systems. I never intended to go vegan, but what I learned was shocking and turned me off to animal products; I just didn’t want to be a part of it anymore. Stephanie: I think that it’s best not to judge others’ diets but to be available to answer questions and share your knowledge if asked. When you are pushy about something as personal as food, others get defensive and don’t want to listen. I think its best to lead by example, to walk the walk, and to be a mentor. Stephanie: Something I’ve experimented with is eating times. I found that when I eat a large breakfast and lunch and either nothing for dinner or something very light (maybe some fresh fruit or a small salad) I have a lot more energy when I wake up. When you think about all the energy it takes to digest food it makes a lot of sense. Stephanie: “Health, excellent or ill, is passed to our children not through our genes but primarily through our recipes.” — Joanne L. Mumola Williams. Stephanie: It’s hard to do but I ignore any negative comments online. If I receive a negative comment in person, I just smile at them and don’t give them the satisfaction of an argument. It’s hard to take an attack for a lifestyle choice that is benefiting humans, animals and the planet. Not every individual understands that though, they usually think you are just weird. You just have to believe in your heart that what you are doing is right and hope that one day that mean ol’ bully will someday be more compassionate. Stephanie: I’m a sucker for Vegenaise, Pepperjack Daiya, Rice Milk, Earth Balance, hemp seeds, kale chips, and Amande Coconut Yogurt.